Robert March Hanes, 1890-1959 Robert March Hanes papers (#4534). Selected letters, 1917-1918. Hanes, Mildred Borden -- Correspondence. 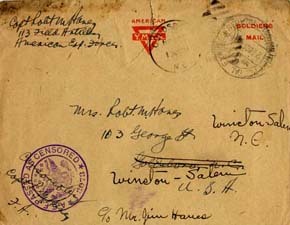 Hanes, Robert March, 1890-1959 -- Correspondence. Soldiers -- France -- Correspondence. Soldiers -- North Carolina -- Correspondence. United States. Army -- Military life. United States. Army -- Officers -- Correspondence. United States. Army. Field Artillery, 113th. Battery A.